*The DIS publishes reviews of meals that we pay for. 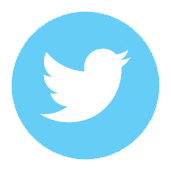 We only utilize discounts and offers if they are available to the general public, such as annual passholder discounts and Tables in Wonderland membership. We receive no outside compensation for our dining experiences so that we may give our honest opinions about price and value. 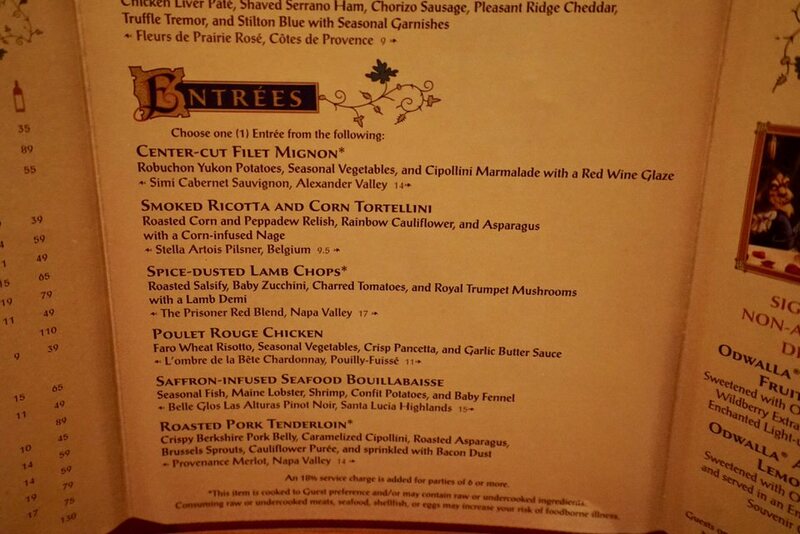 Be Our Guest Restaurant in the Magic Kingdom has really stepped up their dinner service with their new Prix Fixe menu. 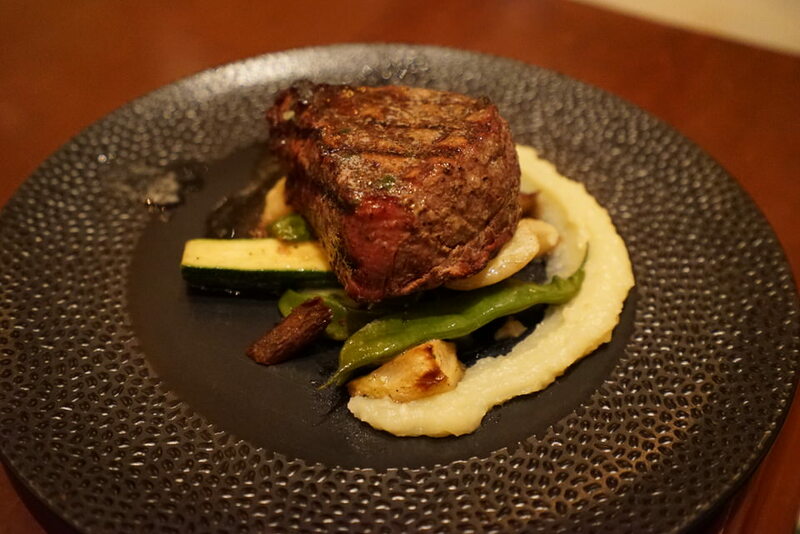 We were excited to try out the reimagined meal at the ultra-popular restaurant as they previously offered an à la carte menu at dinner which was one Table Service credit on the Disney Dining Plan. 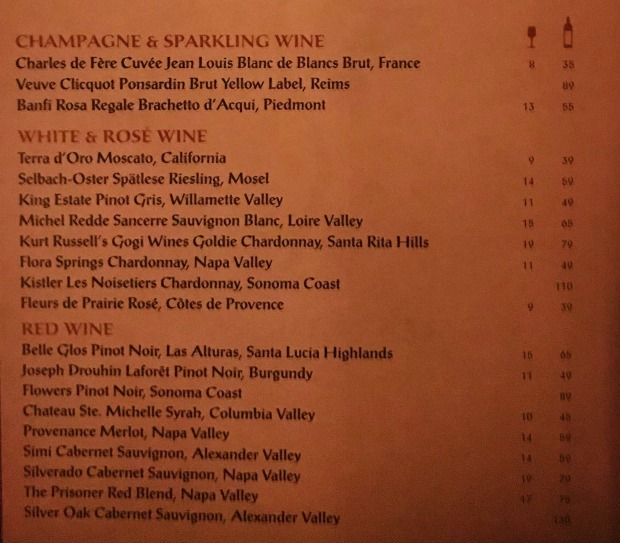 As of yesterday, July 27th, the dinner menu is now a prix fixe, 3-course meal and costs two Table Service credits on the Disney Dining Plan. 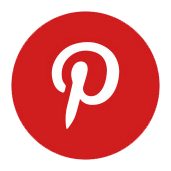 The meal is priced at $55 for adults and $35 for children ages 3 to 9. We were lucky enough to score a last-minute, same-day dinner reservation (shocking, I know! ), so we headed over. Once we checked in for our 7:25 p.m. reservation, we only waited about 5-minutes before receiving a text message that it was time to be seated. As we walked through the restaurant, we were thrilled to see that Beast is still meeting and greeting guests during dinner time. We were seated in the Rose Gallery, but all three dining rooms were being utilized during our visit. Our server arrived at our table just minutes after we were seated to share his excitement about the brand new menu they were rolling out for the first time. He took our drink order and shared tidbits and recommendations on a few of the menu items including which were his favorites. There is bread service before your meal, and since it was the first night of the enhanced dinner service, they hadn’t perfected their new bread just yet, so we received their standard rolls. Their new bread will be a house-made Sourdough Loaf that will be served in a special basket. The bread will be served warm and not unsliced; guests will pull it apart. Also, there will be a space baked into the loaf for their new house-made butter that will be topped with a black sea salt. 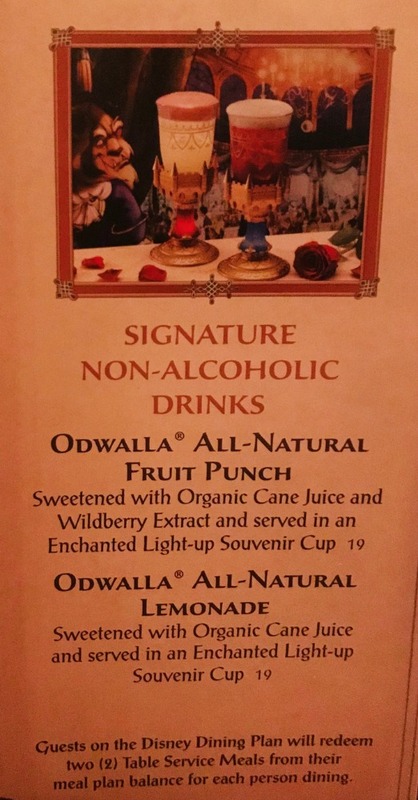 You might recall that Be Our Guest Restaurant was the very first dining location inside of Magic Kingdom Park that offered alcoholic beverages and there are signature non-alcoholic drinks available as well. There was a nice selection of six appetizers to choose from and we decided on the Escargot and the Charred Octopus, even though everything sounded incredible based on Simon, our server’s descriptions. 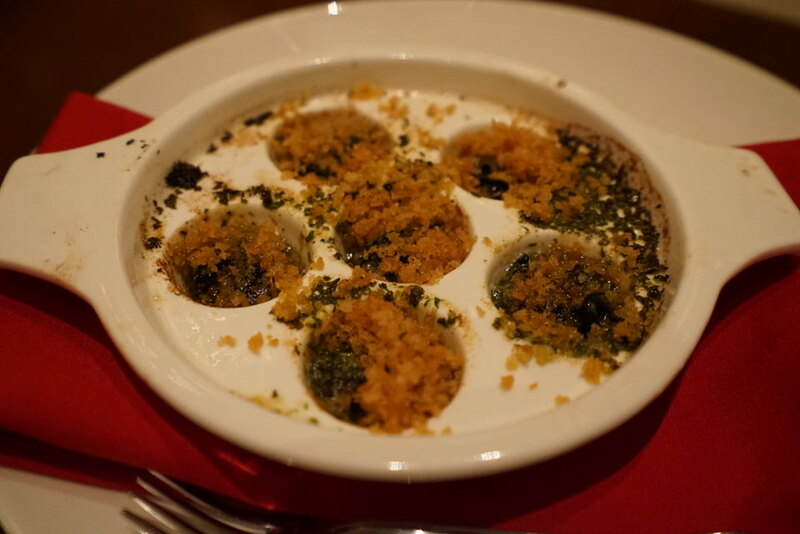 I’ve recently become a fan of escargot after trying it for the first time in a Disney Cruise Line restaurant and this version was a little bit different, but absolutely top notch. The Herb-Garlic Butter was just right and the combination of Toasted Gremolata and parmesan cheese made for one perfectly prepared and delectable bite. Octopus is something I’ve never tried before and when Craig said it tasted like chicken, I decided that now was as good a time as any to give it a go. I was afraid that it might be a bit too exotic for me, but I was pleasantly surprised as the flavor and texture were both delicious. The red sauce had a lovely red pepper flavor – not spicy at all – that made me really happy to have tried it. Craig is a huge fan of octopus and he really loved this dish also and could tell that it was very fresh. 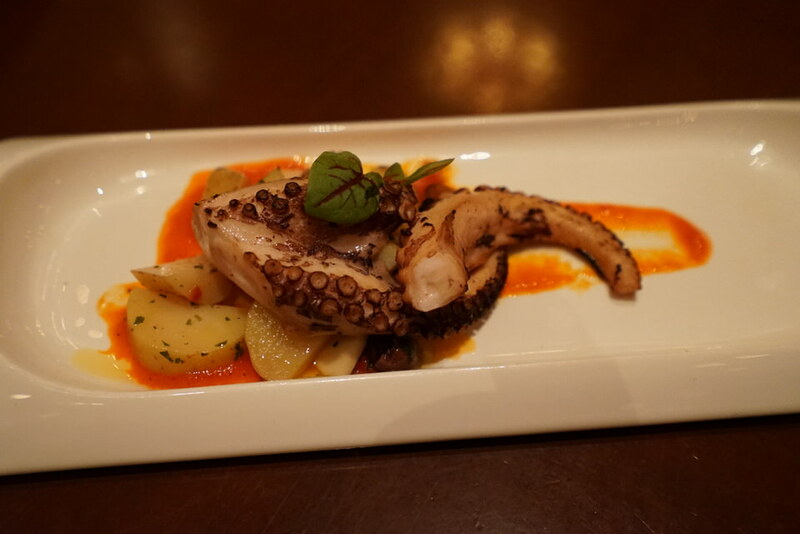 He also appreciated that the octopus was cooked perfectly with a crispy outside and chewy inside. Moving onto the entrées, our server highly recommended the Center-Cut Filet Mignon as well as the Smoked Ricotta and Corn Tortellini which he said was a new recipe and was out of this world. 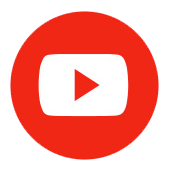 We took him up on his recommendations and they did not disappoint. I ordered my steak cooked medium and it was spot-on and seasoned so perfectly. It was very tender as well, in fact, I used a butter knife to cut it without any issue. The Yukon Potatoes it was served with were mashed and so delicious. Even though the filet was a good 8 ounces, I was wanting more of those potatoes because of how great they were. 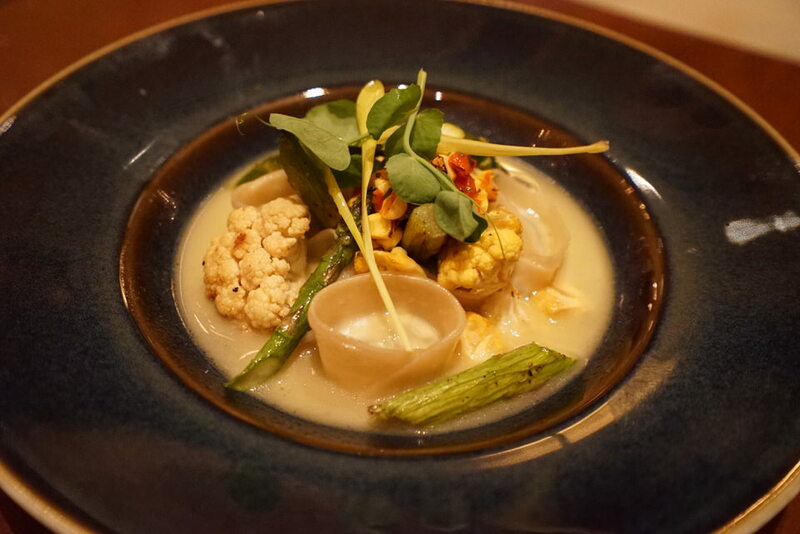 The Smoked Ricotta and Corn Tortellini dish was really delicious as well. They were packed with big corn flavor and the addition of smoked ricotta made for a perfect blend. The portion size of this dish was a bit on the small side, however. There were only six tortellini. Their shape made them bigger than most regular tortellini you typically see, though. If Craig hadn’t loved and ate about half of my filet (because I was saving room for dessert), I feel like he may have left wanting more food. The new prix fixe dessert might be my very favorite because you get a trio instead of having to choose only one of these sweet finishes. I was actually in awe when this gorgeous plate of deliciousness was set down in front of me. 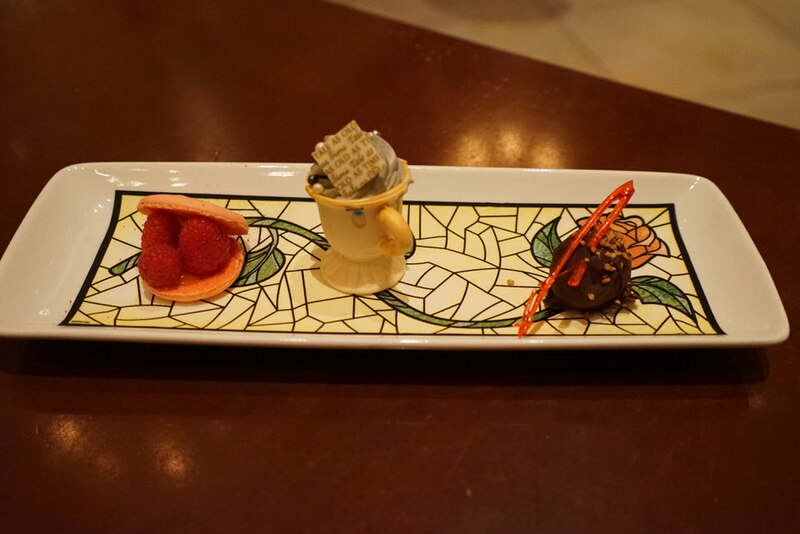 When we commented on how magnificent the presentation was, our server explained that what we both thought was a stained glass plate was actually a white plate lined with gorgeous, edible sugar paper! 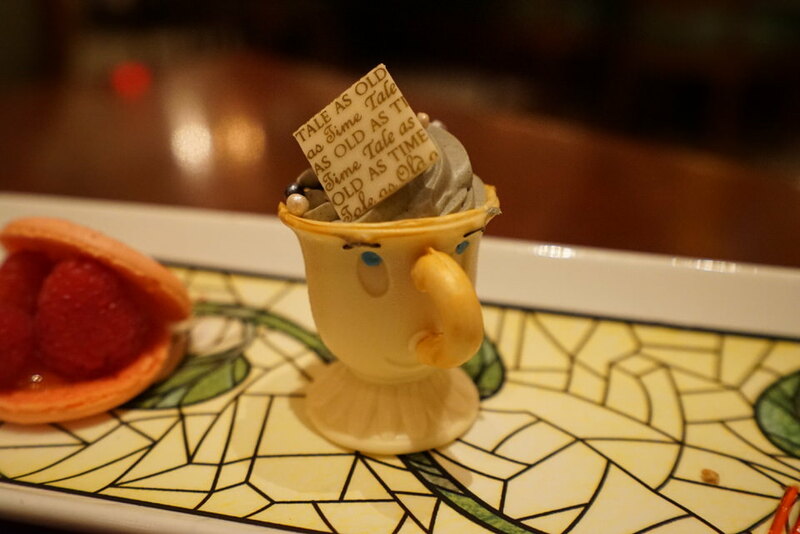 The paper didn’t have any flavor at all, but magical touches like these really make the entire experience that much more special. The Dark Chocolate Truffle was rich and delicious. It was topped with a hard candy swirl that had a Grand Marnier flavor. 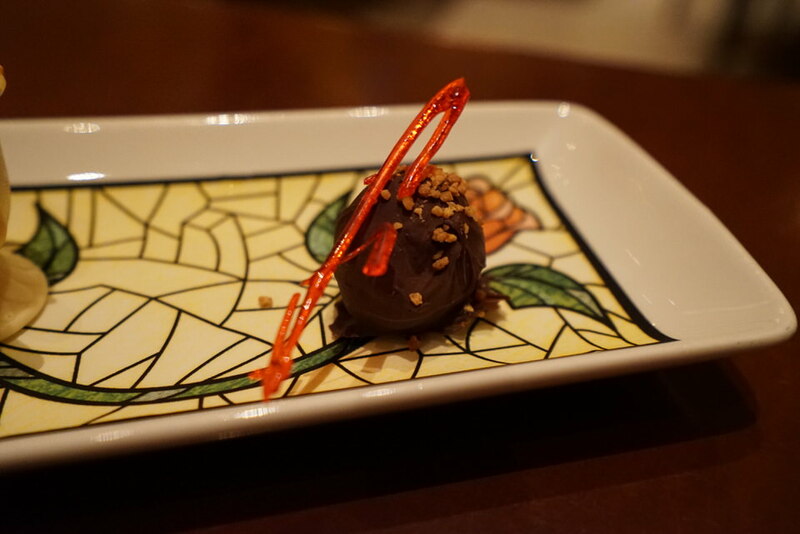 The Grand Marnier made an appearance on the inside of the truffle as well. Next was the Almond Macaron. We both thought this was going to be hard to bite into and were so surprised at how soft it was; they were so fresh! 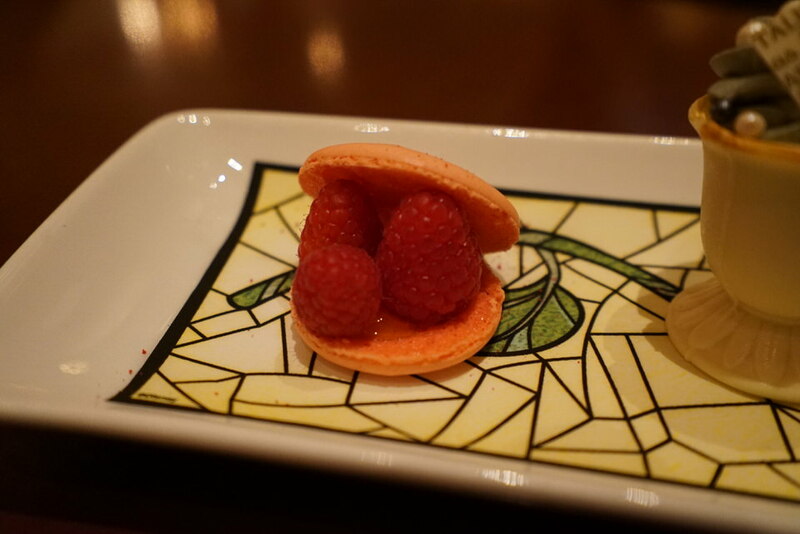 The tartness of the lemon jam inside paired with the sweetness of the fresh raspberries and the light and airy cookie was absolute perfection. 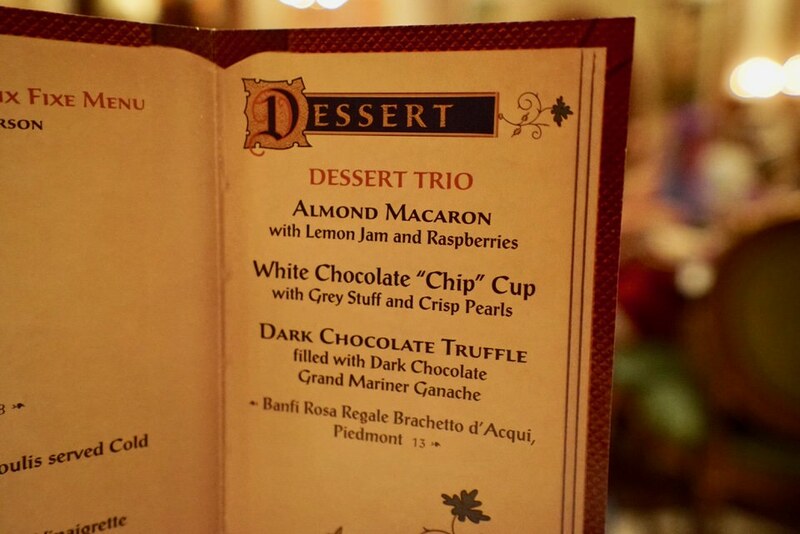 The pièce de résistance on the plate was the White Chocolate “Chip” Cup with Grey Stuff and Crisp Pearls. This little beauty was almost too adorable to dig into, but we managed. The Grey Stuff was delicious indeed and the entire cup that was made from white chocolate was also superb – the handle and the base were solid chocolate – YUM! White chocolate happens to be my very favorite, but for those who don’t have a sweet tooth like me, you might find it too sweet. The kids’ version of the Dessert Trio is slightly different from the adult version and really cool. 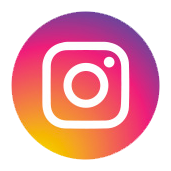 The kind folks over at Disney Food Blog gave us permission to use their photo so we could show you what it looks like – we didn’t realize it was so different or we would have requested that one. Notice that there is no color on Chip but there is edible “paint” and a brush to allow the kiddos to create their own masterpieces. The Dark Chocolate Truffle does not have the hard candy decoration on it and there are no fresh raspberries in the Almond Macaron. 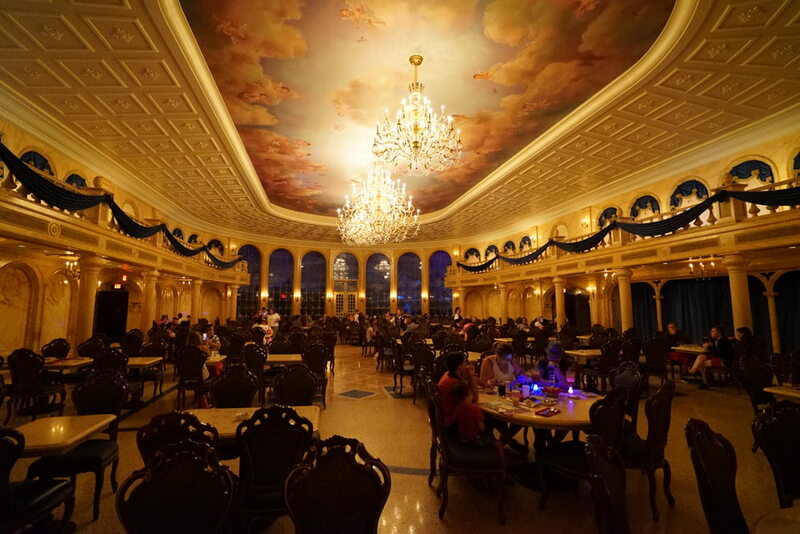 Overall, we both felt that the folks at Be Our Guest really knocked this new dining experience out of the park. 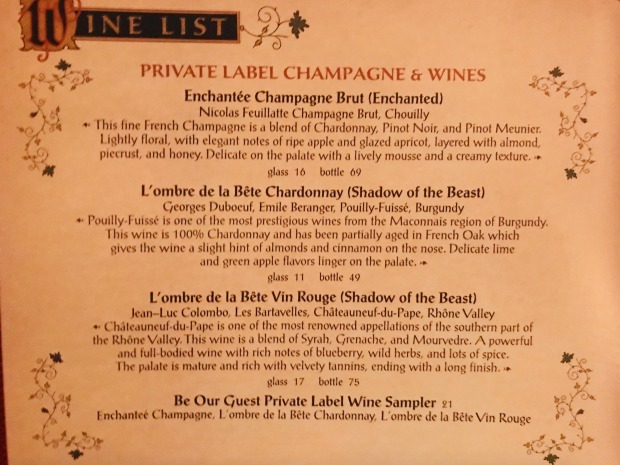 While we feel that the $55 price tag is a good value for what you’re getting, you need to choose carefully and make sure you’re getting the best bang for your buck if you’re using the Disney Dining Plan. Remember that this dinner is considered Signature now and requires two Table Service entitlements per person. We both agreed that although the food quality has noticeably improved and the experience was wonderful, you might be better off paying out of pocket on this one. We verified that both Disney Vacation Club and Annual Passholder discounts are still able to be used as well as Tables in Wonderland. We were also impressed with the level of attention we received. Our server made sure to allow the perfect amount of time between each of the three courses. We did not feel rushed in any way, but we did not want for anything either. Careful attention was paid not to bring out our entrées until we were both completely finished with our appetizers and dessert was not brought to us until we were both done with our entrées. Along with many others, one of my biggest pet peeves is when your entrée is delivered before you’ve finished your appetizer. 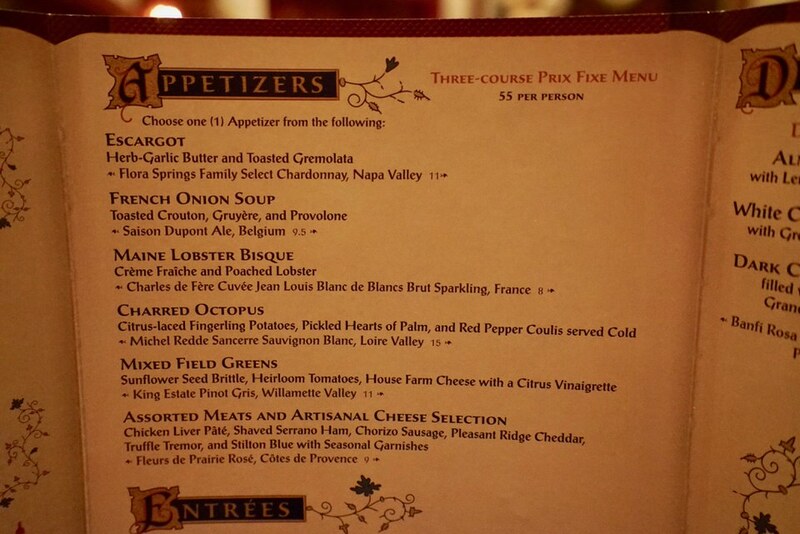 Our server also let us know that rolling out this prix fixe menu had been the original intention of the dinner service at Be Our Guest since the restaurant first opened back in 2012 with the addition of New Fantasyland, but they decided to wait until they had everything just right – that’s a good thing! It was very apparent to us that the Cast Members were very proud of this new menu. A manager even stopped by during our meal to check in and make sure we were loving it. 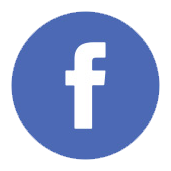 We give this experience two thumbs up! 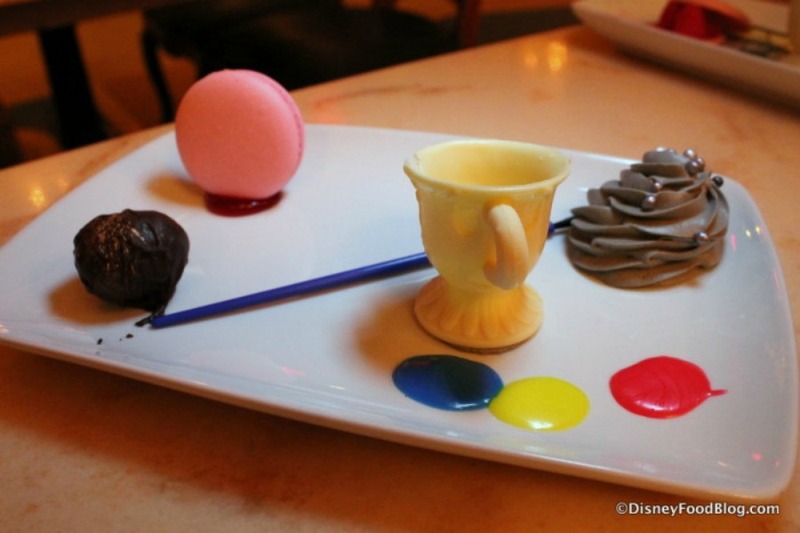 If you want to try it on your next Walt Disney World vacation, be sure to make your Advanced Dining Reservation up to 180-days in advance either online or by calling (407) WDW-DINE.